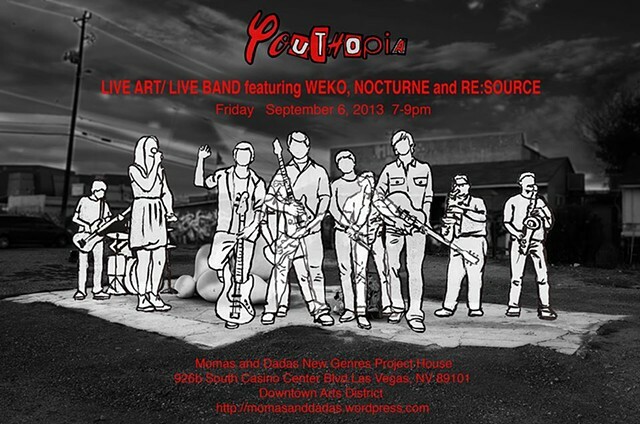 ‘Youthopia’ @ Momas and Dadas New Genres Project House this First Friday – September 6th, 7-9pm in the Las Vegas Arts District!!! LIVE ART/LIVE BAND – Youth finds utopia in art and music. A fusion of performance art and live music using a slab of broken pavement as center stage. WEKO: West End Knock Out is a hard rock band from Henderson, NV who’s music draws influence from such bands as Avenged Sevenfold, Metallica, Green Day, and System of a Down among others. Nocturne is a rock band covering music from artists such as the All-American Rejects, U2, Fall Out Boy, and Imagine Dragons. Nocturne utilizes alternative instruments not included in the average rock band such as saxophone, trombone, and trumpet giving the band a slight twist. RE:SOURCE: “Take me, I’m yours”- Complimentary Las Vegas hotel shampoo, lotion, body wash, etc… will be on display and available for the general public.